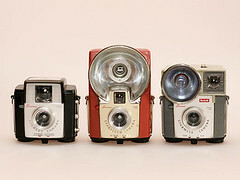 The Kodak Star series of cameras was a very successful range of simple plastic cameras. Over 10 million of these were made from 1957 to 1962, with the range continuing into the late 1960s. The original design was by Arthur H Crapsey. All were based on a similar layout: the film spools and a light baffle were mounted on a floor, which carried the advancing knob and a latch; the rest of the camera dropped down over this floor/spool assembly. Each model had various combinations of different viewfinder and flash arrangements - some built-in, some external, some with no flash facility. Some models were available in different colours, although black and grey seem to be the most common. 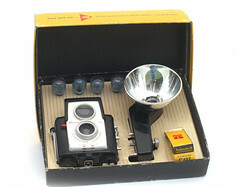 The "star" name was applied to 127 film cameras, but there were similar models made for 620 film. 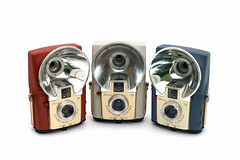 These cameras were also manufactured under other names, and with slight variations for premium sales (such as the Bullet II - a Starlet without the flash contacts) and other languages, e.g. the Brazillian Rio 400. Coe, Brian, Kodak Cameras: The First Hundred Years, pp.53-57 Hove Foto Books, Hove, East Sussex, UK: 1988.